Thunderbolt is of special interest to the attendees of the National Association of Broadcasters (NAB) show, since it provides the throughput needed for video production. Intel likes to make Thunderbolt announcements at NAB, and this year, the company revealed that Thunderbolt Networking would be expanded so that Macs and PCs can be directly connected. Since the release of OS X Mavericks, Thunderbolt Macs have been able to directly connect to each other. 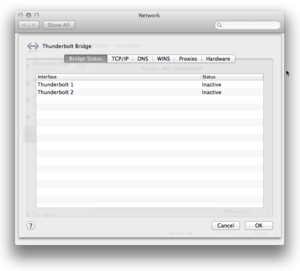 You'll find a Thunderbolt Bridge option in the Network system preference. Owners of Thunderbolt-equipped Macs already had Thunderbolt Networking available to them, since Apple released OS X Mavericks. 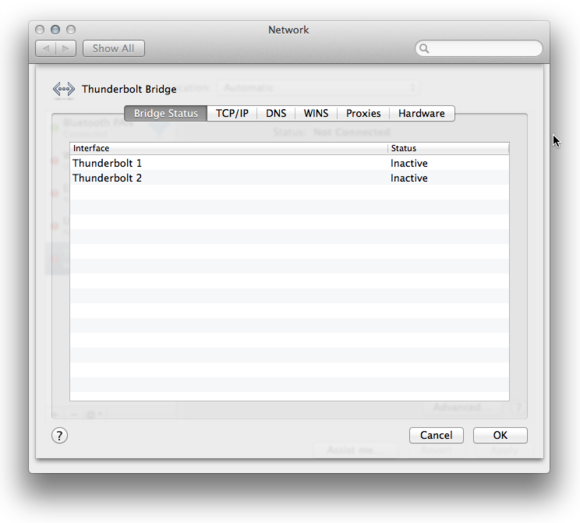 In order use Thunderbolt Networking on a Mac and PC, a PC software driver needs to be installed. Availability of the PC driver has not been announced, but Intel was performing demonstrations in its booth at NAB. According to a post on the Technology@Intel blog technical PR manager Dan Snyder said that Thunderbolt Networking’s performance is comparable to 10-gigabit ethernet. “By offering simple and fast file-sharing, Thunderbolt Networking enables backup or upgrade across two computers like never before, using existing cables and connectors,” said Snyder in his post.